Iron Creek is a great trail for snowshoeing and is just a few minutes from Spearfish SD. Where is Iron Creek in Spearfish Canyon? If you are entering the canyon from Spearfish SD on Highway 14A it is about 11 miles. If you get to Savoy you’ve gone too far. The parking lot is on the west side (right side if you are traveling from Spearfish) just before the bridge that crosses Iron Creek. Snowshoeing is an outdoor activity that can be enjoyed people of all ages. Basically you can go as fast or as slow as you like or your physical condition allows. Don’t go alone. It is always a good idea to have a buddy along in case you encounter any problems along the trail. Breaking trail can be strenuous. If the trail you are on hasn’t been use since the last snow, take turns breaking the trail. Bring lot of liquids and snacks. Sometimes when the weather is cold we forget about drinking enough water. Pack more than enough along, stop frequently and make sure everyone in your group is staying hydrated. Throw some duct tape in your pack just in case you need to make some repairs in the field. Use poles. Poles improve your balance and make it easier to go up and down hills. Dress in layers. Wear layers of breathable fabric and remove or put layers on as the conditions warrant. Clothes. If you live in a cold climate, you probably have plenty of warm clothes. Just remember to dress in layers and have plenty of warm clothing. Snowshoes. Most snowshoes are very similar, lightweight aluminum with durable webbing and deck. I’ve had great luck with both RedFeather Snowshoes and Yukon Charlie’s snowshoes. Just make sure the snowshoes have adjustable binding. Telescoping poles are easier to carry in your vehicle, but any ski poles will do. Basically any trail you enjoy in the summer you could snowshoe in the winter. Do keep in mind that groomed cross country ski trails are not the place to go snowshoeing. Snowshoeing on a cross country ski trail ruins the groves for the skiers. The Black Hills National Forest website has some free maps, here. 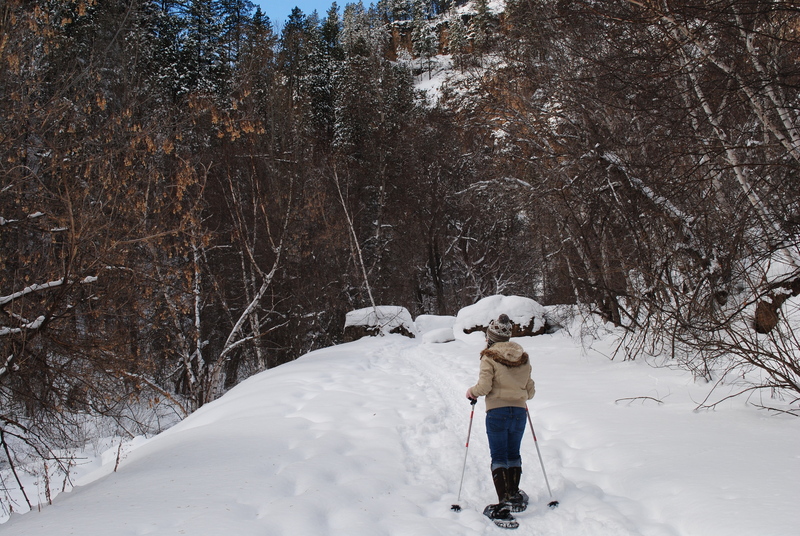 Here is a slideshow of photos we took while snowshoeing Iron Creek in Spearfish Canyon.